A bit more on China first. 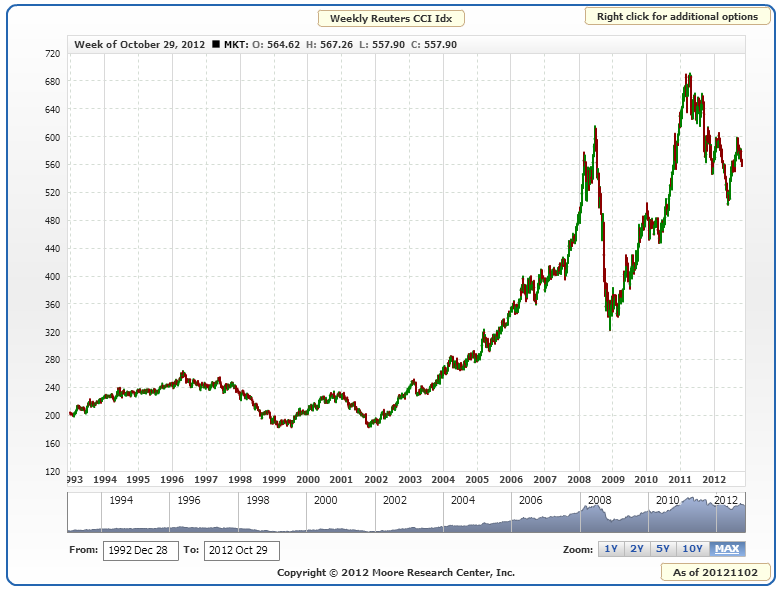 I acknowledge Marketguy15’s point about Chinese stocks having made a parabolic top in 2007. It was a speculative parabolic, with the Shanghai Composite reaching a p/e of around 70, and these take time to wash out. If we consider other historic examples of speculative parabolics on stock indices, then the 1989 Nikkei perhaps didn’t make its ultimate bottom until 19 years later (if the Oct 2008 low remains in tact), whilst the 1929 Dow made its nominal bottom 3 years later, as did the 2000 Nasdaq. But we could also note that the 1929 Dow didn’t gain true upward traction again until 12 years later, around 1942, and the 2000 Nasdaq had a major setback again in 2008. 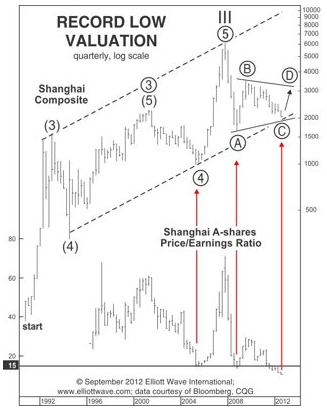 So, the Shanghai Composite may not reach back up to its 2007 peak of over 6000 any time soon. However, it’s the valuation that draws me in. The p/e of 7.8 is the lowest since the Shanghai Composite index’s inception, and globally historically buying indices sub p/e 10 has returned handsomely for the next 10 years. The Nikkei never reached undervaluation for most of the 19 years it took to wash out. The Nasdaq at its nominal bottom in 2003 was still overvalued at at p/e of 34. 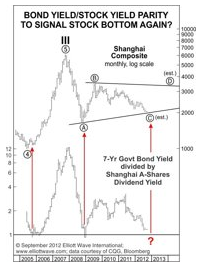 The Shanghai Composite is also yielding 3.8%, and this is almost parity with the 7 year bond, which has attracted buyers historically. The technical set up looks promising for a reversal, as shown in the last post. My buy order went through on Friday. On to global macro. The aggregate of economic surprises for the US, China and Europe is still in an uptrend. ECRI leading indicators the US have paused, but are still positive 5.9. 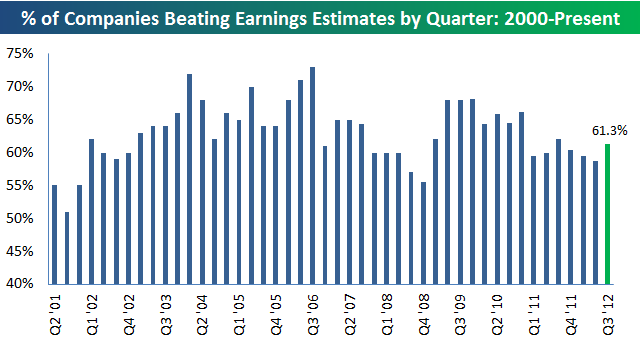 US earnings have improved as the season has progressed, and the beat rate currently exceeds recent seasons. 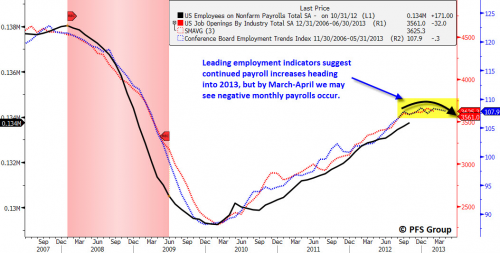 US jobs data should continue to improve into the start of 2013 then roll over. 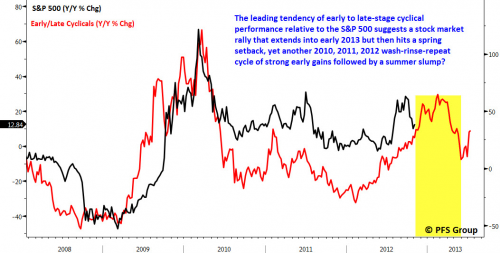 And the performance of US cyclical stocks suggests the SP500 should rally into early 2013 before rolling over. Marc Faber is now forecasting that stocks could make a counter trend rally into the start of 2013 before continuing downward – i.e. no new highs, but a rally that falls short of the existing 2012 highs. That fits fairly well with Tom Demark’s counter trend rally forecast (though he expects a SP500 marginal high, whilst the Nasdaq makes no new high), and to some degree the late November market top predicted by Eurodollar COT. 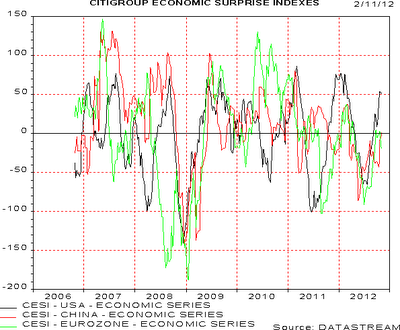 The markets should also rally by presidential seasonality around the US elections. I believe the uncertainty due to the neck-and-neck polls have postponed this, but assuming there is a clear victor I expect the markets to rally later this week. Continued outperformance in cyclicals (versus the wider Sp500) supports this, as does the pick up in earnings beats. So I still maintain my forecast for stocks to change trend here to rallying, and then will judge developments in leading indicators, breadth and so on, whilst that occurs, to assess whether we are likely making a topping process already or whether we can push on upwards into the start of 2013. There remain notable differences in how US, European and Asian indices are poised. The Hang Seng broke out of the long term triangle and has pushed on bullishly whilst US indices have corrected. The Nasdaq looks bad technically, yet the Dax has held up well in what still appears to be a bull flag above 2012’s previous highs. The FTSE remains in its long term triangle but like the Dax has held up well over the last few weeks. Should we now get a rally in global equities, the FTSE is likely to break out, like the Hang Seng. As for commodities, the current correction could continue into late November, by Gann, before they begin their parabolic ascent. The COT picture and technical picture for the Euro-Dollar, together with the US elections, suggests the US dollar could rally here for a little period and that could continue to impede commodities into late November. Gold made a big red candle on Friday through 1700 support, suggesting it needs longer yet to correct and consolidate. Until/if gold breaks out upwards, there remains the possibility that it peaked in 2011. I don’t want to re-analyse gold here, but on balance of probability, I still maintain that it is heading for such a breakout, and that it recently broke upwards out of its 11 month consolidation, with this pullback of the last couple of weeks being a consolidation only before further gains. However, it’s worth a look at this chart from Barry Bannister. Could we have just seen the post peak value trap bounce and now we proceed lower? The gold peak of 2011 wasn’t much a parabolic, but the silver peak certainly was. If we look wider, at the CCI commodities index, then, again, how do you read the chart compared to the above model? I would suggest the best fit is for the two spikes are the bear trap and bull trap, with the greed parabolic still to come ahead. 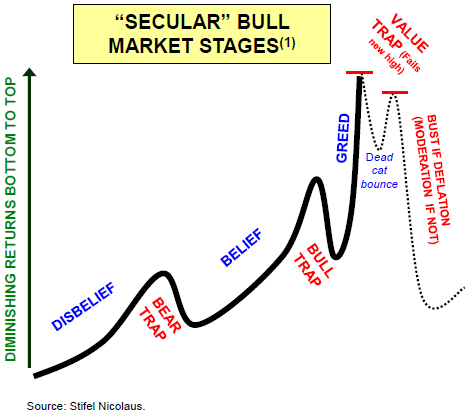 If so, that would fit with my solar work and Gann projections, both of which suggest commodities are about to take off on their major final upleg of the secular commodities bull. If that isn’t so, and the parabolic peaks in commodities have largely passed, with oil in 2008, silver in 2011, cotton in 2011, rare earths in 2011 and so on, then what we would have seen over the last few months would amount to dead cat bounces in commodities (such as gold, soybeans, corn) which should now fail and break into downtrends with momentum, as per the model above. I suggest such a scenario would be accompanied by a new stocks bear and a global recession, and out of that stocks bear new secular bull momentum would be born. The whole process would have been brought forward compared to my solar/secular projections (and Gann also) which suggest commodities should make their parabolic finale into 2013 and then a recession comes to pass after that. I have not changed my mind. I maintain my commodities long positions on balance of probability (by my references). But there’s a clear dividing line in the leading commodity of this K-winter secular commodities bull – gold – either it is in a renewed uptrend to new highs and is soon to complete the correction of the last several weeks and burst upwards, or it now gathers momentum to the downside and breaks beneath 1600, adding weight to a failure beneath the highs. So once again, it is delicately poised. Hello John another great post love reading your work. How’s the holidays going? I have being reading your blog for about year now and I am always impressed with the different view you bring to the markets. I am a part time spread better and cfd trader and have a small amount of money out of it so far but was just looking to know your views on the best way to invest in pm’s. I think pm’s will rocket next year mainly because of the amount of money everyone seems to be printing. Thanks again for all your work and hope you and the family are enjoying yourselves. Hi Ronan, thanks. I am finding Singapore a great place. Personally, I mainly choose to spreadbet gold and silver rolling dailies. I don’t want to be stuck with the physical, and I stock market fortunes muddy the picture for gold stocks (though I do own some having bought at oversold and overbearish extremes), and in the UK there are tax advantages to spreadbetting. November 2 article in MarketWatch appears to support your “forecast for stocks to change trend here to rallying”. Article mentions the recent surge in small-caps relative to large-caps in the last few days. You mentioned the FTSE above…chk this possibility out (not only a potential H&S in play right now but then could turn out to be an even BIGGER H&S down the road)…. yes, I haven’t updated the slope in a month or two so but you understand the premise. Realized volatility across all markets are suppressed to near or at 5 year lows. From currencies (minus euro), to equity indices, to commodities like oil, copper, and silver. The exception to this is US treasury bonds (or IG corp). Whether you look at a proxy like $TLT or the 30-year bond futures, their realized volatility is higher than the $SPX realized volatility. Really now? This is pure silliness. These higher risk markets like commodities, commodity currencies, and equities have had their volatilities held down through monetary policies and assumed fiscal policies across the globe. Recent history shows this does not end well. I’d like to refer to “The Black Swan of Cairo” in these times.